Buck, Dwayne and Weston (not pictured), along with their dogs arranged the meeting. They guide hunts in Florida and Tennessee and may be reached at 321-960-4287. I ended up running about 500 yards after the dogs to catch up with the hog. The “hunting outfit” was just a jacket with the spare 20-round FAL magazine in a pocket. I had my Kahr P9 for backup. I was pleased to have kept up with pace the animals set without tripping over or running out of breath. (Photo by Robin Curry) The pig was shot at about seven yards while running obliquely. The 1-4x scope was set to 1x, illumination turned on to make it work more like a red dot. 150gr Federal Fusion soft point hit just above the left eye and continued to the top cervical vertebra. He dropped at once and did not move. I should have the photos of the skull and the recovered bullet later this month. The RFB worked really well for the hunt — I didn’t have to worry about the noise or the recoil and had 19 more rounds in reserve. It was fairly easy to run fast with the short bullpup. While this was a very easy level hunt, it was just what a beginner like me needed to get the basics. When comparing 18″ Carbine and 24″ Hunter versions of Keltec RFB, I realized that the length of the 18″ version with AAC 762SD-6 suppressor is 1/10″ longer than the 24″ version. The weight and the balance would be fairly similar, with the long barrel being only a little heavier. So the Hunter version is actually practical for running around the woods and not just the deer stand. You’d lose the sound reduction but gain 200-300fps of muzzle velocity. This entry was posted in ammunition, author, beast, hunting, rifle, sound suppressor and tagged 308Win, bullpup, Florida, hog, pig, pork, RFB, кошерное. Bookmark the permalink. Who doesn’t love .308 for work? It does the job. Nice Pig! Huff! Using an e-vil a-salt rifle on an innocent pig;you ought’a be asahamed! A TRUE sportsman would’a gone one-on-one with the hog & used a knife. Ever read Peter Capstick’s story about hunting boar with a knife in Argentina? No thank you, I really don’t want a hoofprint in my forehead. Well done & happy you had fun on the hunt . Good looking pig too. Way to go! 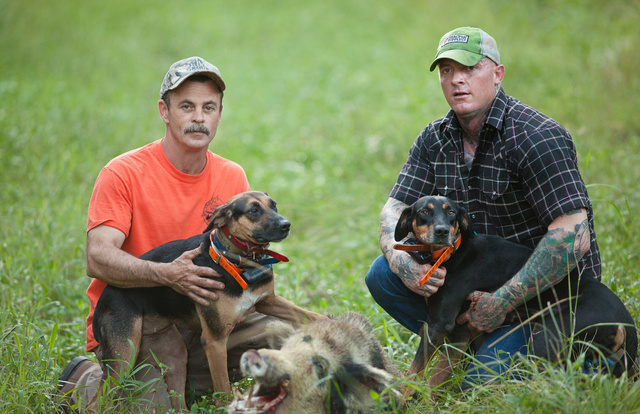 Pigs are overpopulating and need hunting in just about every state. Food processing, protein, step one. Where’s your white chef’s hat? Glad you had a successful hunt. Looking at those two dogs using the gun would have been considered unnessary here in New Zealand, Don’t blame you though the craziset thing about “pig sticking” is keeping your hand away from the snapping jaws of the dogs while trying to slip the blade between the pigs ribs. Oleg if you ever in NZ let me know if you want to go hunting with out the kel tec. How much difficulty would I have in bringing the rifle to NZ and back into the US? All non-semi Auto over 765mm in total length and MOST semi Autos from my understanding are pretty strait forward to bring in and out. Customs will issue you a temporary licence at the boarder this will allow you to purchase ammo in NZ, it is advisable to apply ahead of time. For hand guns and E catagory long arms (Military Style Semi Automatics or MSSA for short) you Must apply ahead of time. (though I do know an Australian that was didn’t know this and was still let in after NZ customs made some calls his states police department). – bayaonet lug, flash hider, magazine capacity (or apperance of) greater then 7 for centrefire or 15 for rimfire, A “military pattern free standing pistol grip”. The courts have ruled the the phrase “militart pattern free standing pistol grip” must be taken as a complete statement so with a 7 shot mag, flash hider removed the hunter version would comply as a sporting firearm but you would more than likely have an argument with customs on arrival which you may well lose. Nice pig – thanks for sharing the details of the hunt. 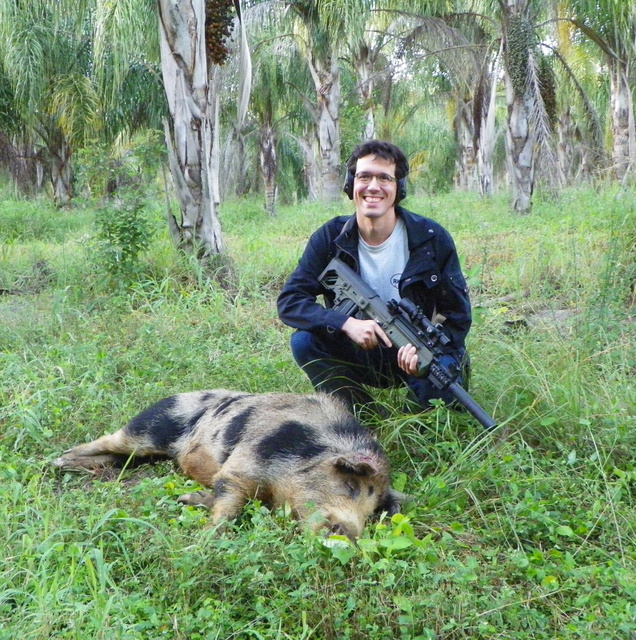 We have too many feral hogs here in Florida, and I am always in favor of taking them in pretty much any way possible. I hope that one makes it to the dinner table. Nice job taking out the bacon. those pigs destroy everything in sight.